The chilling report that the Pentagon is planning a “three-day blitz” targeting Iran hasn’t gotten much play here in the U.S. The British press, meanwhile, has been buzzing with what the Bush administration’s plan is for Iran, and the news isn’t good. The Times of London, which reported on the Pentagon’s plans, has a source who claims that the U.S. is looking to launch air strikes against 1,200 targets in Iran. The Department of Defense is always “planning” something. It’s what a military does, scenario planning. But with the tough talk coming from President Bush and a series of odd bits of news (a proposed gradual troop drawdown from Bush and the jet carrying nuclear weapons over the U.S. “by mistake”), a bunch of grim theories are emerging. Cross posted at Punditman blog. President Bush is expected to choose a replacement for Attorney General Alberto R. Gonzales by the middle of next week, and former solicitor general Theodore B. Olson has emerged as one of the leading contenders for the job, according to sources inside and outside the government who are familiar with White House deliberations. Other candidates still in the running include former deputy attorney general George J. Terwilliger III and D.C. Circuit Court of Appeals Judge Laurence H. Silberman, according to the sources, who declined to be identified because of the sensitivity of the discussions. Others whose names continue to be mentioned in congressional and political circles include Pepsico general counsel Larry D. Thompson, a former deputy attorney general; Solicitor General Paul D. Clement; and Verizon general counsel William P. Barr, who served as attorney general for Bush’s father. A person close to Barr said yesterday, however, that he does not appear to be on the short list of candidates now being considered. In a letter to Pelosi Friday, Boehner asked for $1 million for professional investigative staff, consultants and other expenses. He also asked for an expansion of the probe to include “exceedingly controversial events in the House that occurred in close succession in early August,” such as the malfunction of the automatic voting system and alterations of the Congressional Record. Pelosi made clear to Boehner two days earlier that she was in no mood for swelling the investigation into mini Watergate hearings. “There is no reason for this review to become protracted as the committee’s charge is limited to a very small number of matters,” Pelosi wrote in a terse letter to Boehner Wednesday. Boehner, however, sees the matter differently. The investigation stems from a rancorous dispute over a vote on an amendment to the agriculture appropriations bill during a late evening in early August. Rep. Mike McNulty (D-N.Y.), who was presiding in the Speaker’s chair during the vote, declared the Republican amendment failed on a 214-214 deadlock even though the electronic tally board in the chamber showed the amendment winning by a margin of 215-213 when he gaveled the vote to a close. Instead of a terrifying and interesting storm of doubt, my ship of faith only encountered in these “new atheists'” books a few annoying water balloons. The sales of Dawkins, Hitchen and Harris might be red hot, but their content is just as pale and anesthetic as my herring lunch in Lithuania. Hitchens relates some telling anecdotes in graceful language, and Harris raises a few interesting points, but all in all these books have an imaginative and emotional flatness one does not encounter in the writings of classical atheists and agnostics. In style and content, these books have the same blend of quasi-journalism and sterile indignation that characterizes most op-ed pieces. The signs are everywhere. Many of America’s top-selling books right now are angry, in-your-face, atheist manifestos. Judges try to outdo each other in banning references to God like the Ten Commandments and the “Under God” phrase in the Pledge of Allegiance. And nearly half of Americans, according to a recent Gallup poll, would be willing to vote for an atheist for president of the United States of America – a nation founded by devout Christians. In its groundbreaking September edition, titled “THE RISE OF ATHEIST AMERICA,” WND’s monthly Whistleblower magazine provides a powerfully eye-opening analysis of what’s really behind the current atheist phenomenon. “This is atheism’s moment,” brags David Steinberger, CEO of Perseus Books, celebrating the tremendous success of anti-God bestsellers like “God is Not Great: Why Religion Poisons Everything” by journalist Christopher Hitchens and “The God Delusion” by Oxford evolutionary biologist Richard Dawkins. “Mr. Hitchens has written the category killer,” he says, “and we’re excited about having the next book.” That’s right – this fall the publishing world will further cash in on the anti-God juggernaut with the release of “The Pocket Atheist,” featuring the writings of famous atheists, edited by Hitchens. 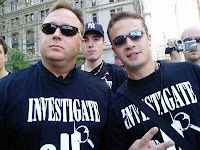 NEW YORK – Media activist Alex Jones was arrested by New York Police Department officers while filming a documentary about the sixth anniversary of September 11th and joining the protest against the official version of what happened on 9/11. NYPD officers arrested Jones for “unspecified charges” and removed him from the protest crowd to be taken to the nearest police precinct where he was later released following a protest outside the jail by other 9/11 truthers who chanted “let him go”. 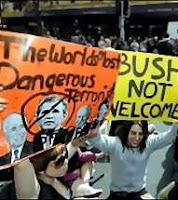 Two policemen were injured and three protesters arrested as thousands marched under tight security through Sydney on Saturday in a protest against visiting US President George W. Bush and the Iraq war.